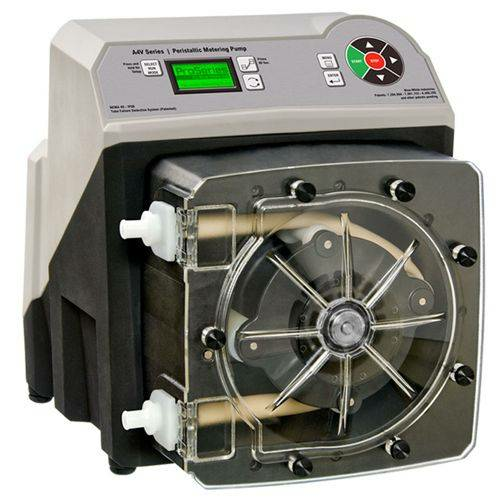 Flex-Pro A4 Series Peristaltic Pump for high pressure and high accuracy applications. Self priming - even against maximum line pressure. By-pass valves are not required. Output rates to: 158.5 GPH (600 LPH) and pressures to 125 PSI (8.6 Bar). SCADA Inputs include: 4-20mA, 0-10Vdc, and Pulse inputs for remote external speed control and 0-30 VDC / contact closure remote start/stop. Operator friendly digital touch pad with menu driven software. VGA Graphic multi-color backlit LCD displays remote/local control status, motor speed, output rate, input signal values, service and alarm status. Outputs include: Scalable 4-20mA or pulse, one 250V/6A relay and three 115V/1A contact closures assignable to monitor up to 17 different pump functions including TFD, FVS, remote/local control setting, motor on, fault, current operating mode, and others. Compatible with Blue-White's output Flow Verification Sensor (FVS) system. No maintenance brushless variable speed motor. Specially engineered tubing for long life at high pressures. Meets FDA 21 CFR requirements for food contact applications. Patented Component Control System. A method used to control two or more positive displacement pumps in a system.